An inflamed boil caused by Staphylococcus aureus. Staphylococcus aureus is a pathogen to humans causing many illnesses that range from mild infections to life-threatening diseases. It can cause disease by direct infection by the bacteria or by toxins produced by the bacteria. Fact:Staphylococcus aureus is one of the main causes of nosocomial infections such as surgical wound infections and blood infections. 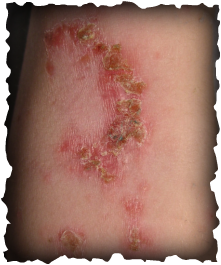 Impetigo caused by Staphylococcus aureus.